BENTON HARBOR – Michigan State Police troopers began work at the Benton Harbor police station this week, in an effort to help a city with a violent crime rate even higher than Detroit. Capt. Michael Brown, 5th District commander for the state police, said two troopers and a state police sergeant were stationed with Benton Harbor police on Monday in its detective bureau as part of the state’s Secure Cities Partnership initiative. The initiative was created by Gov. Rick Snyder to support law enforcement efforts in Detroit, Flint and Saginaw as FBI statistics rank them among the nation’s top 10 most violent cities. Brown said the initiative was broadened to include cities on the west side of the state such as Benton Harbor, Benton Township, Muskegon and Muskegon Heights. After meeting with Dan McGinnis, acting public safety director for Benton Harbor, Brown said state police determined the best thing they could do was provide Benton Harbor with assistance in their detective bureau. The process has been a five-month effort between both agencies. According to crime stats, Benton Harbor, with a population of 10,020, recorded 236 violent crimes in 2013 and had the highest violent crime rate per 1,000 residents in Michigan, at 23.6. Detroit, with 688,701 residents, had 15,115 violent crimes in 2013, with a rate of 21.9 per 1,000 residents, and Flint saw 2,026 violent crimes, with a rate of 20.3. Violent crimes counted included homicides, criminal sexual conduct and armed robberies. The crime rate is predicated on population numbers, which inflates Benton Harbor’s rate due to of its low population, McGinnis said. “I don’t agree with the methodology, but at the same time I’m not going to turn down additional help that’s going to help us close cases and get citizens the justice they deserve,” McGinnis said. Daily operations will remain the same, as state troopers will use Benton Harbor’s systems, network and evidence locker, McGinnis said. McGinnis said the state’s presence within Benton Harbor will be open-ended. Benton Harbor police has three detectives, but with the addition of a state detective sergeant and two detective troopers, the size of the department’s detective bureau has doubled. Benton Harbor will not pay for the troopers’ salaries as they are covered by the state. Cooperation between the state police and the Benton Harbor Police Department is not new. When crime in Benton Harbor escalated in 1996, Gov. John Engler ordered state troopers to help patrol the city. Contact Tony Wittkowski at twittkowski@thehp.com or (269) 932-0358. Follow him on Twitter @tonywittkowski. MUSKEGON, MI — The smell of turkey was welcoming as one walked up to the parking lot at Reeths-Puffer High School on Thursday, Nov. 27. Students, parents, faculty and other volunteers spent their Thanksgiving morning and afternoon visiting homes in different regions around Muskegon County by handing out Salvation Army meals. Dan Sawka, captain of the Salvation Army located on 1221 Shonat St., said there were enough paper bags to serve 2,000 meals to the community. Those bags included turkey, stuffing, mashed potatoes, green beans, gravy and a roll. With stacks of green chairs encapsulating the soon-to-be filled bags, Muskegon County residents stood in line and waited. The scene of hundreds gathering together to help an entire county is something Sawka looks forward to every year. The line of volunteers snaked around the cafeteria and doubled back, where at the end of the line was the Gergen family. The five-membered family is new to the area and decided to take part in its first food drive in the area. The Gergens’ stop took them to Muskegon Heights, where they handed out 19 different meals to at least seven different families. Muskegon resident and former Muskegon County Sheriff Robert Carter was on hand to see what was started more than 20 years ago. Carter was an integral part of the process in creating the current partnership between the high school and the Salvation Army. The Salvation Army was holding the annual event in a small kitchen in its building before moving to the larger venue. After Reeths-Puffer’s current school was built, Carter went to the school board and helped join the movement. 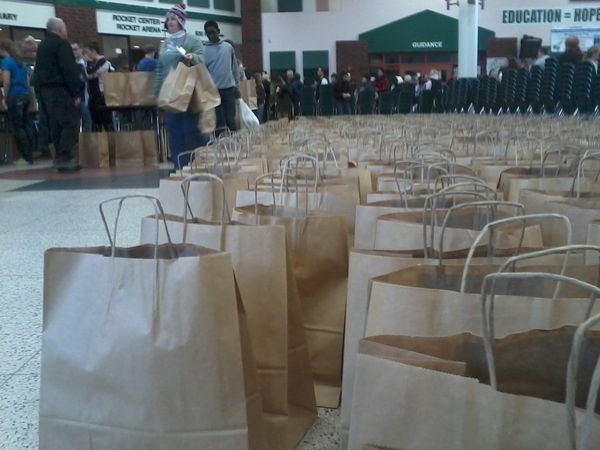 Smiling faces could be seen walking out of the high school with bags of food in their arms. Amid the cluster of dishes and food assembly lines was Ralph Lemieux. Behind the scenes, Lemieux was helping set up the stations and was involved in cooking the coveted turkeys. The Twin Lake resident has been at it for more than a decade alongside his wife, who has helped coordinate the cohesion between Reeths-Puffer and the Salvation Army for the yearly effort. MUSKEGON HEIGHTS, MI — Sandra Longmire has spent the last three years feeding the hungry at God’s Kitchen Along the Lakeshore. On Wednesday, Nov. 26, the Muskegon resident was able to do more than that by spreading some holiday cheer with a bevy of Thanksgiving dishes. 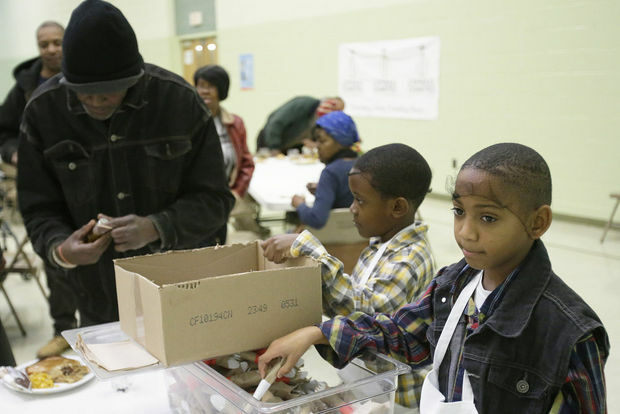 Several attendees arrived for the hour-long event, where they were served free food that included the normal Thanksgiving meal – turkey, stuffing, corn, coleslaw and apple pie. The kitchen, which is held within the Sacred Heart Parish — located on 150 E. Summit Ave. — is open Monday through Thursday. However, on those special holidays, Longmire said she tries to give returnees what she normally eats at home. Alexia Martinez, who attends Orchard View Middle School, has been volunteering her time at God’s Kitchen for almost two years now. The 13-year-old wasn’t the only youngster helping out, as several family members of Longmire were helping by handing out soda and nutrition bars. Among the crowd that was busy eating was Muskegon Heights resident George Williams, who said he comes out to God’s Kitchen Along the Lakeshore almost every day. MUSKEGON HEIGHTS, MI — The Muskegon Heights Fire Department has started a new program that is designed to help keep families safe in their own homes. Fire Chief Chris Dean said fire officials began giving out smoke alarms and installing them for free as of Nov. 6. This program does exclude rental properties because they are already required to have working smoke alarms and because the grant that helped fund the program has its limitations. With about 1,000 smoke alarms in storage, Dean said they have already started to push them out to the community. 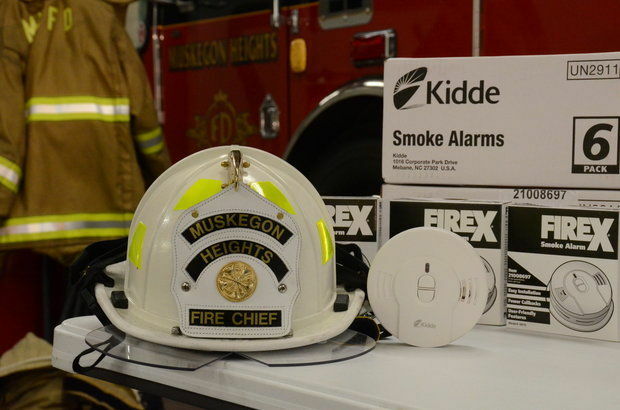 The Muskegon Heights Fire Department is willing to install the free smoke alarms and provide a home fire safety assessment. The fire department is looking for a high level of compliance, as the goal is to install 100 smoke alarms by Jan. 1. Dean has been with the MHFD for almost 19 years, and he said the department used to have a substantial amount of fire fatalities and injuries. With no fire-related deaths for the last seven years, Dean said there is still much more that can be done. According to Dean, a person is two-thirds more likely to be killed by a fire if there are no working smoke alarms in his or her household. Anyone interested in receiving a smoke alarm to be installed by the fire department can call the hotline at 231-733-8893. There is also a link on the department’s Facebook page to a form to contact officials for a scheduled installation. MUSKEGON HEIGHTS, MI — The family of one of the homicide victims from Tuesday, Oct. 14 in Muskegon Heights has created a fundraiser that will go toward funeral costs. Judy Bushman, 62, was found dead around 7 a.m. Tuesday in her home in the 2600 block of Wood Street. Sarah Hooper, Bushman’s daughter, created a fundraiser for people to donate anonymously. The site is operated out of www.gofundme.com, where those interested in donating money can search for Bushman’s name, which pulls up a picture and brief description of her death. Hooper and her husband were the ones who discovered Bushman after not hearing from her the previous day. The family is in the process of planning her funeral along with the fundraiser to cover some of those costs. As of 8 p.m. Thursday, the site had raised more than $240. Hooper said she is also in the early stages of holding a candlelight vigil in front of her mother’s house at 7 p.m. Saturday, Oct. 18. 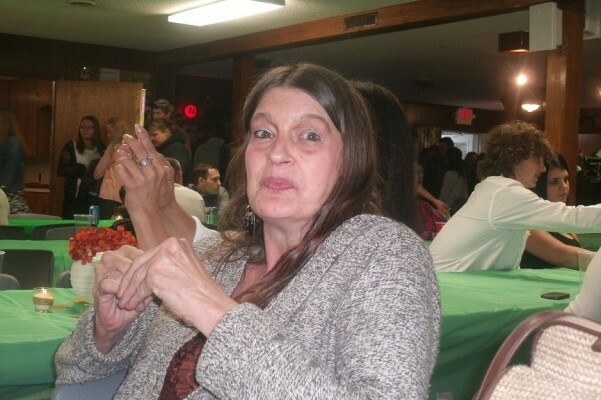 Leon Means, 61, is currently lodged in the Muskegon County Jail on the murder charges of Bushman and 63-year-old Anna Lawson, who was found dead in her home with similar wounds. Means was arraigned on Wednesday, Oct. 15 on four counts of open murder. Anyone interested in donating as little as $5 to the family can visit the site at http://www.gofundme.com/fvnbko. MUSKEGON HEIGHTS, MI — Spencer Norman was said to have had an encyclopedia amount of knowledge when it came to the Muskegon area. When he passed away last year, Norman’s absence was quickly filled with words of remembrance from those whose lives he touched. More than a year after his death, the Friends of Muskegon Heights Library created the Spencer Norman Portrait Dedication to commemorate his life and legacy to the town. The dedication will be held Saturday, Oct. 18, from 1–3 p.m. at the Muskegon Heights Library, which is located at 2808 Sanford St. The portrait of Norman was created by regional artist and Muskegon resident Lori Eslick, Newman said. Eslick, who is normally a children’s book illustrator, has spent time creating portraits in her downtime. One of the organizers for the dedication is Margaret Willey, who knew Norman from his time spent at numerous events. Willey said the artist was thrilled to be asked to create the portrait once she knew who it was for. After the luncheon and unveiling, Eslick will be present to discuss her process. When the project received the green light, Willey put the word out for people to contact Eslick with stories about Norman. The end result was a new spin on a portrait that is expected to be as unique as Norman himself. Grand Haven resident Steve Platt became close friends with Norman over the years and will be present at the commemoration to share stories of Norman on Saturday. Norman and Platt worked on a number of committees, ranging from their work with the library to ones dealing with local gardening projects. The two often met for a meal while discussing a range of topics from social unrest to racial issues. To Platt, Norman’s lasting impression will be one of generosity and intelligence. MUSKEGON HEIGHTS, MI — The Mission for Area People has been active the most in the last decade than the rest of its 45-year history. Because of this, director Diana Wright-Stubbs has had to think outside the box for trying to raise the appropriate funds. The fundraiser will be held on Monday, Oct. 20 from 6:30–9:30 p.m. at the Trillium Banquet Facility, which is located on 17246 Van Wagoner Road in Spring Lake. Tickets run $30 per person, with a discounted price coming to $175 for a table of eight. 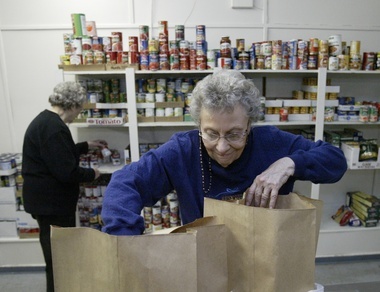 Mission for Area People now has a variety of programs, which began to branch out of the normal food and clothing pantry. The non-profit serving Muskegon County boasts a healthy food pantry, with no junk food and lean meats. Their services also include those in need of dental assistance as well as Christmas toys and Thanksgiving baskets. None of these programs existed 12 years ago until Wright-Stubbs became director. Since these continual additions made to these programs have increased, so has the price for running the non-profit. As a result, the fundraiser was created to help the non-profit help its community. In the past, the event has raised an average of $7,000 a year. Wright-Stubbs said she hopes to see $10,000 accumulated at this year’s fundraiser because it is the 10th year it is being held. In addition to hors d’oeuvres and beverages, the fundraiser will feature two bands and a silent auction for theme baskets. “We are going to have approximately 18 different restaurants that will be showcasing some of their hors d’oeuvres,” Wright-Stubbs said. The two performances will be marked by the Carl Webb Band, as well as the Mark Kahny Trio. Both have played at the fundraiser before, with the Carl Webb Band performing once a year. Since the vendors are donating their product, the number of tickets being sold will be limited to 350. Those who are interested can purchase tickets at the non-profit’s central location – 2500 Jefferson St. in Muskegon Heights.